265 compression technology lets you save on storage space which allows for longer recording times. 265 technology compresses your video without sacrificing any of the UltraHD video quality. Recording Resolution - 8MP 4K, 5MP, 4MP, 3MP. Record in Widescreen, Quick Access QR Code Remote Viewing on iPhone, iPad, and Android (w/ included free app). Power over Ethernet means the IP cameras connect to the PoE switch with a single cable that transmits both data and power, allowing for an easy installation and setup. Remotely Access Using Standard Windows and Mac Browsers with US P2P cloud server for fast connection. Easy to Install: Connect to and Manage All Cameras on Your Network via Ethernet Cables. Feature-Rich OSD: Camera Name, Time, Motion Detection, Video Loss, Lock, and Record Status Icons. Manual, Scheduled, Motion Detection and Record Intervals (1-120min). 2 SATA, support up to 16TB. Support HDMI (up to 4K) and VGA (up to 1080p). USB/Cloud Backup & Cloud firmware upgrade Feature for Peace of Mind. 2.8mm wide angle lens. 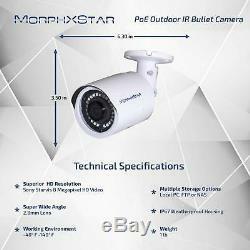 24pcs of SMD IR Light, Remarkable FOV 100° IR LED Night Vision Up to 100 feet. 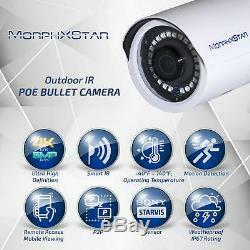 IP67 rated Indoor/Outdoor Weatherproof; Metal Housing. Operating Temperature: -40°F 140 °F. Dimension (LWH) : 6.3 x 3.5 x 3.5 inches. 1 x 8-Channel PoE NVR w/ 4TB WD Purple HDD (Commander x8 4TB). 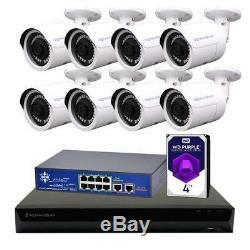 8 x 4K Bullet PoE IP Cameras (Met-XS-W). 1 x 8 Ports PoE Switch (Endeavor G8). 1 x 5ft HDMI Cable for Connecting NVR to Monitor. The item "MXS Surveillance Security System Camera 8CH 4K 8MP NVR POE UHD Camera" is in sale since Sunday, February 17, 2019. This item is in the category "Consumer Electronics\Surveillance & Smart Home Electronics\Home Surveillance\IP & Smart Security Camera Systems". The seller is "morphxstar" and is located in Hacienda Heights, California. This item can be shipped to United States.